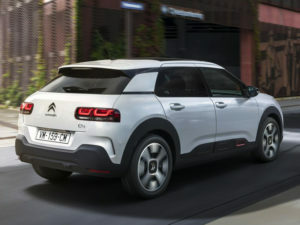 Launched some three years after the launch of the original, the revised C4 Cactus has been updated to fill the role of the C4 hatchback, which has been discontinued, and brings toned-down styling as well as Citroën’s sophisticated new Progressive Hydraulic Cushion suspension and premium seating, plus extra refinement using acoustic glass and additional sound insulation. The latest updates have seen a slight uplift in pricing. Previously the range kicked off with the PureTech 82 manual model in Feel trim, which was priced at £16,575. In the revised model, this engine comes only in the Feel Edition trim that teams up the Feel spec – with enhanced exterior and interior detailing – and is only available until May 2018 priced at £17,265. From this date, the entry-level model will be the Feel trim’s PureTech 110 S&S manual, priced at £17,965, compared to £17,755 prior to the model revisions, while Flair models will also be available priced from £19,865 for the same engine. At the top of the range is the Flair BlueHDi 100 S&S manual – the only diesel option – priced at £20,895 – while the most powerful unit is the PureTech 130 S&S 6-speed manual, a new addition to the range. Speaking late last year at the launch, brand CEO Linda Jackson said the new model brings a change of message compared to launch versions, which had been marketed on best-in-class ownership costs, moving the car into the core of the C-segment and leaving the compact SUV class to the new C3 Aircross. Such a focus on comfort sees the updated C4 Cactus introduce a range of new technologies, including driver assistance systems such as Active Safety Brake, Grip Control and Lane Departure Warning, along with three connectivity technologies, covering Citroën Connect Nav, Citroën Connect Box with the brand’s Emergency & Assistance system and Mirror Screen functionality.